For the past 15 months, the inflation expectations embedded in TIPS and Treasury bond prices have been moving higher, most likely in response to the Fed's increasingly accommodative policy stance. 10-yr Treasury yields—already quite unattractive relative to current inflation—are thus at serious risk of moving higher, regardless of the Fed's determination to keep them low. Fortunately, this is not something to worry about. 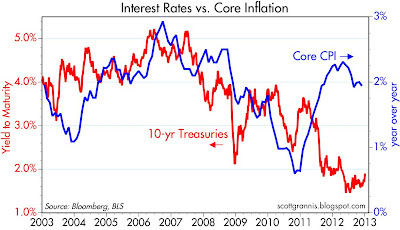 As this first chart shows, Treasury yields and inflation began to diverge in the latter half of 2011; yields fell as inflation rose, an unusual development that could be explained by the Fed's insistence that the economy was so weak that extremely low short-term interest would be required for at least the next several years. 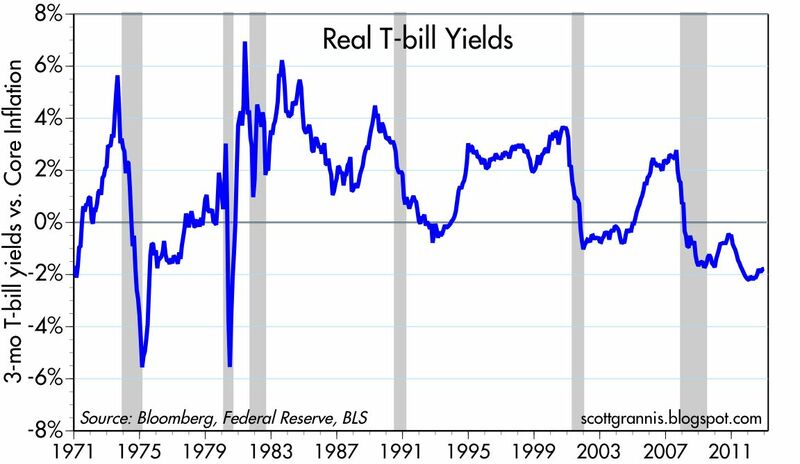 Treasury yields are now about the same as inflation (roughly 2% each), which means that real yields are essentially zero. As the chart above shows, this is a very unusual condition. 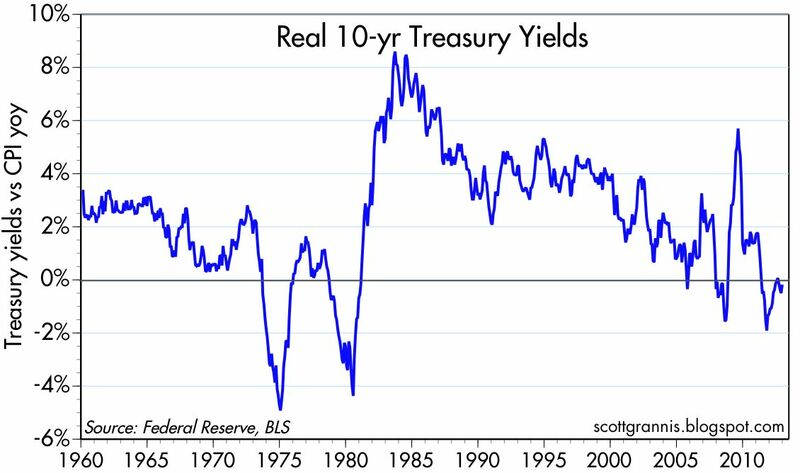 Since 1960, the real yield on 10-yr Treasuries has averaged about 2.4%, and real yields on Treasuries have only been below zero for about 8 of the past 52 years. Notably, real yields were negative for a good portion of the 1970s, a period notorious for its accommodative monetary policy and relatively high and rising inflation. 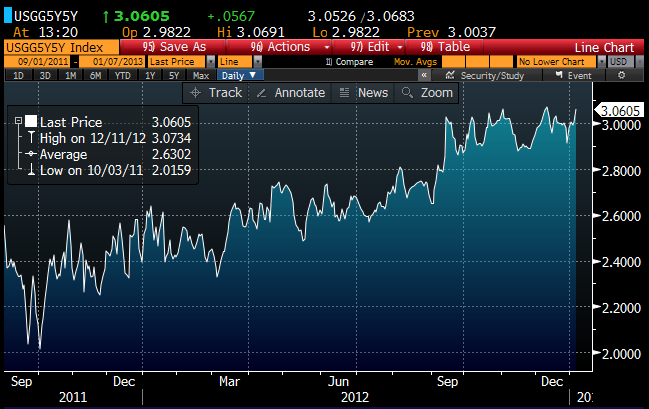 The above chart shows the real yield on 3-mo. T-bills, which is a good proxy for the Fed's effective monetary policy stance: high real yields mean policy is tight, while low or negative real yields mean policy is very easy. Monetary policy has rarely been as accommodative as it is today. If the 1970s are a guide, we should thus expect inflation and inflation expectations to be on the rise today. 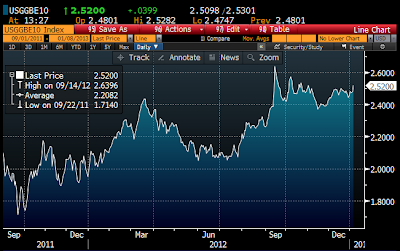 The chart above shows Bloomberg's calculation of the "breakeven inflation rate" for 5-yr TIPS and Treasuries. This is effectively the bond market's assumption for what consumer price inflation will average over the next 5 years. (If future inflation equals breakeven inflation, then an investment in TIPS or Treasuries of comparable maturity will deliver the same total return.) 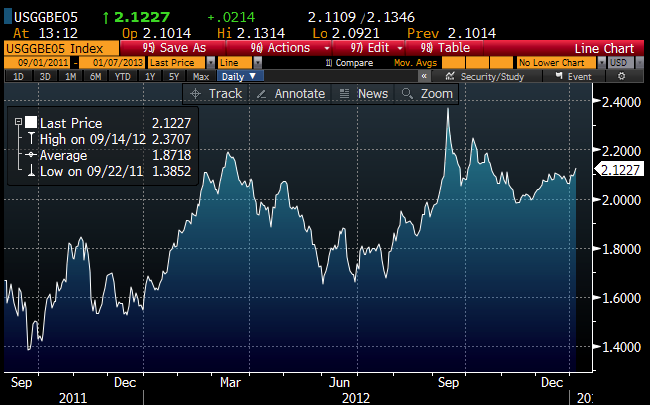 As you can see, inflation expectations have risen from a low of 1.4% in September 2011 to just over 2% today. Of course, it's possible that the bond market could be wrong. As the chart above shows, the bond market sometimes can be very wrong about inflation. This chart is just a longer-term version of the one above it. Note that 5-yr inflation expectations at the end of 2008 were -.78%. In the four years since then, the CPI instead has averaged 2.2%. So the bond market was way underestimating inflation back then, and it could be underestimating future inflation today. This next chart shows the bond market's expectation for what the CPI will average over the 5-yr period beginning 5 years from now. Forward-looking inflation expectations, by this measure, have risen from a low of 2% in September 2011 to now just over 3%. This chart shows the market's expectation for what the CPI will average over the next 10 years. It's essentially a combination of the 1st and 3rd charts in this series. By this measure, long-term inflation expectations have risen from a low of 1.7% in September 2011 to 2.5% today. That's not at all unusual, because the CPI has averaged almost 2.5% over the past 10 years. So although the market's antennae have picked up a sense of rising inflation, it's not yet something to be terribly concerned about. Unless, that is, you own Treasuries that are now promising to deliver negative real returns in coming years. And unless the bond market is once again underestimating future inflation. 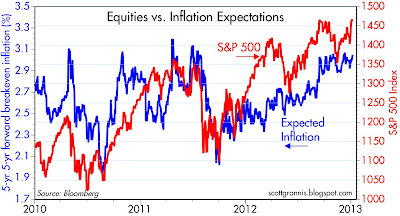 This last chart compares 5-yr forward inflation expectations to the level of the S&P 500. Both inflation expectations and equity prices have moved together over the past 15 and also for the past 27 months, which suggests that the Fed's accommodative policy stance at the very least is driving the market's outlook for nominal growth. Both equities and bonds are assuming faster nominal growth—driven by higher inflation. 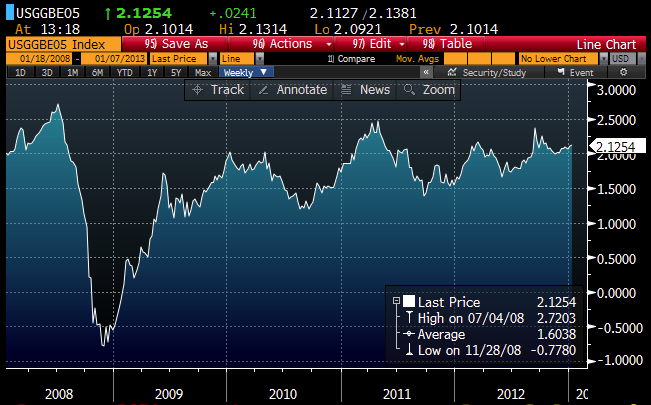 Going back to the very first chart, it seems clear that 10-yr yields are unusually low relative to current inflation. The rest of the charts make it very clear that inflation expectations are on the rise and that at this point there is no reason to believe that inflation will fall. If the gap in the first chart is unsustainable, and I think it is, then it is thus very likely to close with 10-yr yields moving higher. Once again, I take this opportunity to repeat that the current very low level of Treasury yields only makes sense if you view them from the perspective of a market that is extremely worried about future economic growth. Investors are so risk-averse and so worried about the future that they are willing to forgo earning a positive real yield—and accept a negative real yield—in exchange for the perceived safety of Treasuries. The Fed is laying the foundation for higher yields with its accommodative policy stance, since inflation and inflation expectations are unquestionably higher. What will end up delivering higher yields is the return of confidence. As the market overcomes its fears and as risk-aversion declines, Treasury yields will rise; investors will attempt to shift out of Treasuries and into more risky assets, causing relative prices to change. Higher yields will thus be symptomatic of an improving economic outlook and rising investor confidence. They will not therefore pose a threat to the economy, and thus are not something to worry about. The sooner they arrive, the better, in fact. And when they do, we'll likely see higher equity prices to boot. Erm - which investors? The Fed owns the Treasury market. Fiscal deficit = Fed purchases = 1 trillion. You think this is a coincidence? Why do you keep reading things into a rate everybody else accepts is manipulated? The Fed does not own the Treasury market. There are trillions worth of Treasuries that are held by individuals, pension funds, institutions, foreign investors, and foreign governments. There is $11.6 trillion of Treasury debt "held by the public," (i.e., not by other government agencies such as Social Security) and the Fed owns $1.7 trillion. Even if the Fed purchases half of the Treasuries issued this year, the Fed will still own less than 20% of the Treasuries outstanding. This is not nearly enough to allow the Fed to artificially manipulate or control prices. The market is still more powerful than the Fed. The only way the Fed can influence Treasury yields is to convincingly persuade the market that it will keep short-term rates very low for a very long time because the economy is going to be very weak. They've managed to do that so far, but they can't do it forever. 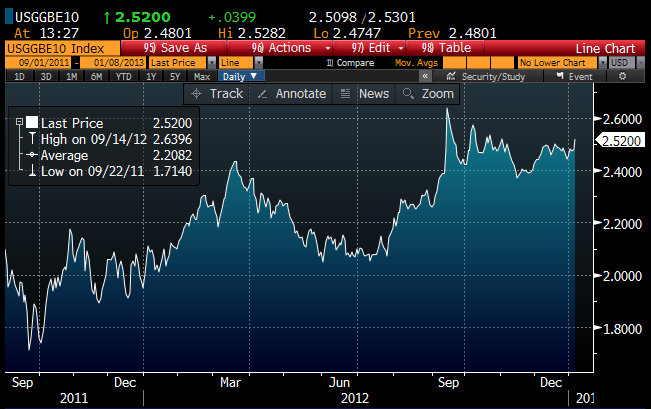 Have you noticed that 10-yr yields are up 50 bps since last July despite the Fed's QE4 announcement? 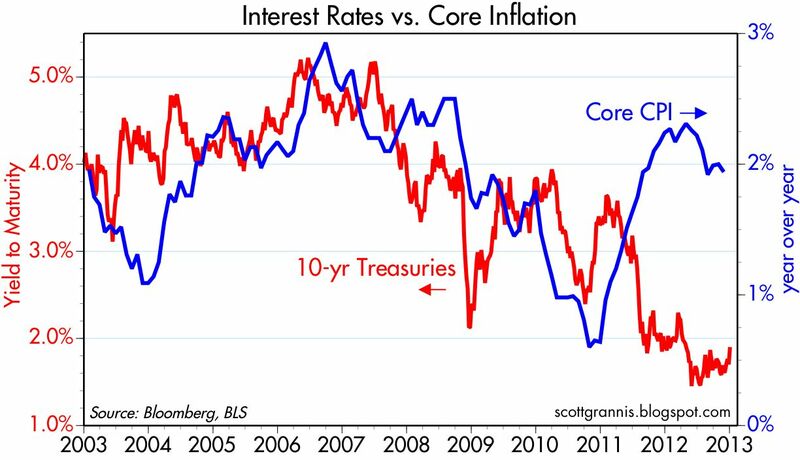 Scott Grannis might be wrong on his outlook for inflation and yields. 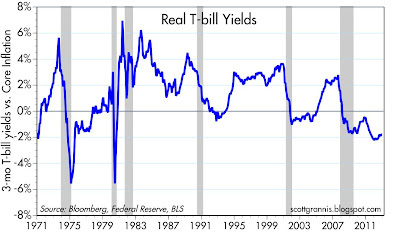 Note the rough trend of real Treasury yields over the last 30 years. Down. This is not a USA-only story. It is a global story. Sovereign debts yields globally are converging on zero. This has something to do with central bank policy, and something to do with huge supplies of capital generated globally. Asia and Europe generate huge anoints of excess capital. Even the USA has pots of capital, in hedge funds, savings accounts, pennon funds, insurance companies (the latter not counted as savings, btw). The Western world is entering the land of zero-bound. What has been scarce throughout history is now abundant. Capital. Expect lower returns, yields. Maybe the Fed can for the USA---but not sure about that, if they continue to target 2 percent inflation (now 2.25 percent, I think). That may not be enough gas to escape zero bound. But when you think about interest rates, think about a world converging on zero bound and a glut of capital--and that these seem to be long-term trends, building up for the last 30 years. BTW, the Cleveland Fed Index of Inflationary Expectations keeps getting lower. it is lower than this time last year. 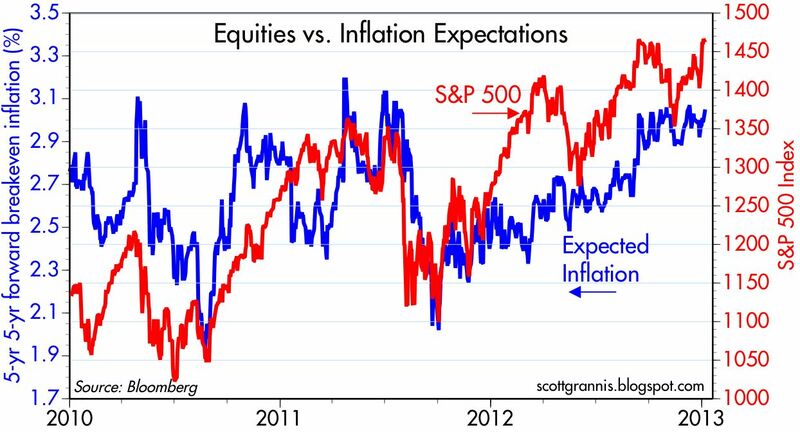 If there is to be a break-out in inflation, the market is not projecting it. Interesting question: The Bank of Japan went zero interest rates and did QE from 2001 through 2006. You would think that zero interest rates and printing money would result in inflation. It did not; they are still stuck in deflation. And what makes the USA different? Assuming the Fed achieves and sustains its goal of 2% inflation on an annual basis, that means the national debt gets collapsed by up to 100% within 50 years -- note that 2% inflation would be well under the 3% average annual inflation that the US has experienced since 1913 when the Fed was created -- inflation is what always happens -- nothing we can say, do, or argue will ever change that -- history is my proof. Not necessarily related to your post, but I'd love to read your take on this article , "The IMF Admits It Was Wrong About Keynesianism"
What are your thoughts on the Fed adopting a different 'preferred' measure of inflation? 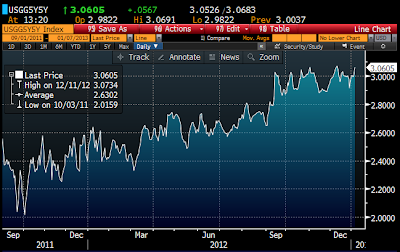 The 5Y5Y forward inflation expectations were generally regarded as the target measure. However, the recent statement targeting unemployment also shortened the target inflation timeframe to a couple of years. I don't think the Fed's recent statement, which set forth guidance for ending QE, reflects a change in their preferred inflation target. I think it remains their intention to target 2% core PCE inflation over the long haul. Re: "The IMF Admits It Was Wrong About Keynesianism"
Business Insider, the source of this article, is not known for insightful articles on economics, and this article is no exception. The IMF rarely gets things right, in my experience, and this is a good example of another wrong-headed conclusion. A good rule of thumb: do the opposite of what the IMF recommends, and you will be successful. 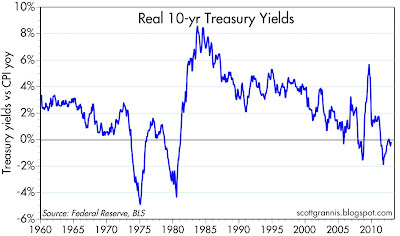 The last time we had a rise in long term Treasury rates the stock market didn't stall out until they got to 6%. The 30yr is now at about 3%.